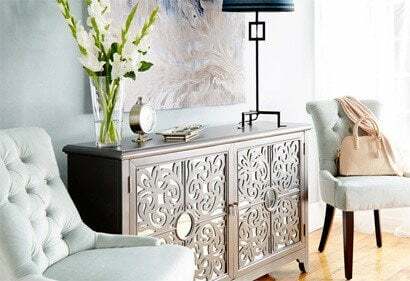 How to paint furniture so it's metallic silver paint has a rich luster that looks expensive is what this post is all about. Here are some of the best tutorials for shiny and aged silver paint looks. 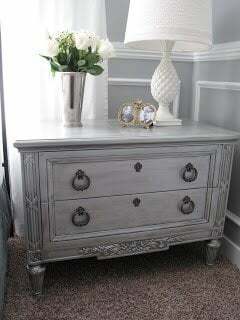 Painted furniture always looks great and I love these painted furniture ideas using silver paint. Not every shiny silver piece may fit in your home, but a beautifully aged piece might. Is Spray Painting Furniture Best? What About Latex Metallic Silver Paint? You can also use latex metallic paint. Metallic tinted latex or enamel paint should be applied with a brush, roller or paint sprayer. They can be more expensive but they often give a better quality finish. Metallic silver paint needs particular care if you want to get results like this. Prepping is important. Silver metallic paint, like most high gloss / high sheen paints will show up every timber imperfection. Unlike milk paint or chalk paint that are more forgiving, metallic paints need the work done up front. Good quality silver paint is expensive compared to other paints but more affordable compared to silver leafing. It's value for money. In most cases, a small container of quality metallic silver paint will go along way. To make it go further, use an undercoat. A tinted grey primer is perfect. Watch your brush strokes. You may need to use a roller to reduce brush stroke visibility. In some cases, you may need to buy a specialty metallic paint roller. They are slightly more expensive but improve the look considerably. Do not water down your paint. It will not improve your paint results. Don't over-brush. This can cause the paint to loose it's metallic lustre. You will end up with patches of gray rather than silver paint. 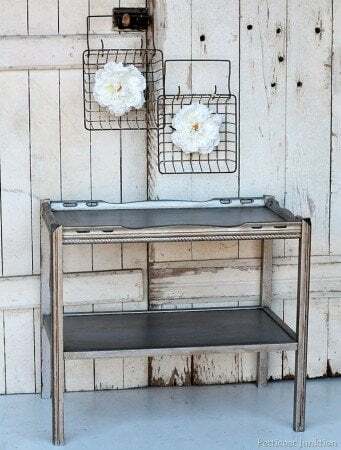 A subtle silver look, or if you can't get your hands on metallic paint, is to use gray paint instead of silver paint and finish with metallic glaze. Paint can cause respiratory problems. Read the manufacturer's recommended environment and temperature range. 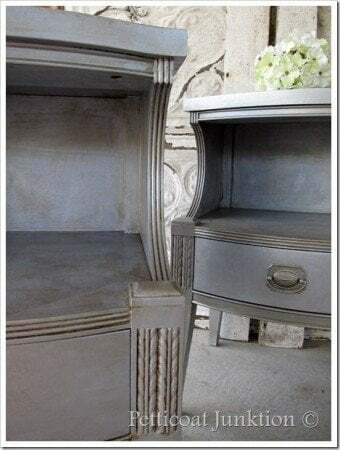 Source: Painted Furniture Ideas If you're learning how to paint furniture, here is a video from Happy Black Chic using Martha Stewart's Metallic Paint Silver, that walks through the entire process. The final result looks great. You can also get Martha Stewart's spray paint in gold, copper and rust. Which is the Best Silver Paint for Painted Furniture? There are a lot of silver paints and each one has its own special look and sheen. Some are easier to work with than others. The paint you use is important - some can look a little thin and cheap. Here is a list of some of the better quality paints! Martha Stewart’s Silver Polish – This comes in a small container and found at Home Depot. Martha Stewart's Metallic Specialty Paint Silver - You can find this for as little as $1.90 depending where you shop. Martha Stewart’s Silver Leaf – This paint is mixed up at the hardware store priced at $22 a can. There are no sample sizes. Quayside and Silver Leaf paint colors are popular. 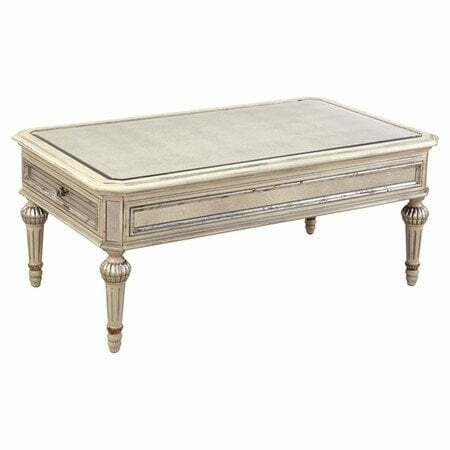 Silver Leaf has a brass accent and has a slightly tarnished look. Rustoleum – Metallic - Rustoleum's basic spray metallic color. Rustoleum, Universal Advanced Formula, Metallic - Flat Antique Nickel. This spray is a paint and primer in one and looks like steel. Krylon’s Brushed Metallic Paints - Good metallic finishes and available in spray cans. Spray thin even coats for the best coverage without drips. These metallic paints are less expensive from $4.38 - see the color range here. Design Master Super Silver from Michaels. Metallic Glaze - If you can’t find the exact metallic paint color you want, use a metallic glaze on top of the paint color you have used to create a metallic look. You can see what some of these paints look like, side by side, at Painted Furniture Ideas. How to Paint Furniture Metallic Silver? 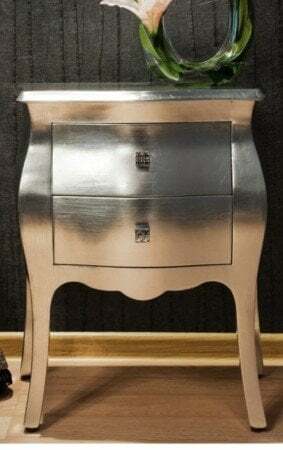 Painting furniture with metallic silver paint can be incredibly easy or very time consuming. 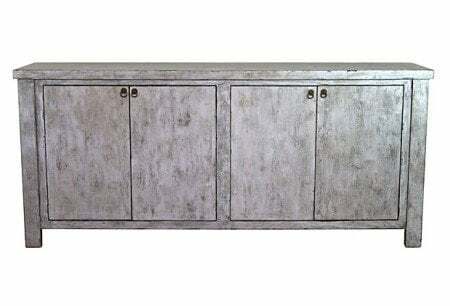 The piece below from Oliver and Rust uses Glidden Gripper Primer in "gripper grey", Martha Stewart Metallic Specialty Paint and Annie Sloan dark wax. You will probably need one small jar of MS Metallic paint as it spreads easily and goes along way. Glidden Gripper Primer in gray must be made up at the store as 'gripper grey' is no longer available. Remove hardware. Add 2 coats of primer to your furniture and allow to dry. Apply 2, or more, coats of Martha Stewart Metallic Specialty Paint. Use a foam roller for the last coat to reduce brush strokes. Make a 'glaze' using Annie Sloan dark wax and mineral spirits. Wipe it over the piece, then remove. Repeat until you have the finish you desire. Paint and/or glaze your hardware to match your furniture, then add it to your furniture when dry. If you prefer an aged look, less shiny and more depth, the aged metallic look is next. How Do You Get an Aged Metallic Silver Paint Look? 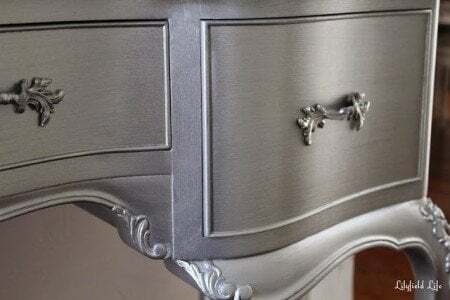 Creating an aged metallic silver paint look by painting wood furniture can take time and paint, as you layer different silver paints until you get the finish you want. Its recommended that you spray paint furniture for a faster and even result. There is a faux version further down this post. Its faster but the results are no where near as beautiful as this piece. This beautiful silver painted dresser from Little Miss Penny Wenny was once cream with a green undertone. Time for a makeover. If a piece is in good condition prime your furniture without sanding. If not, sand well, because every dent will be exaggerated when painted with metallic silver paint. Avoid using a sander on hand carved detailing; instead hand sand with steel wool to keep the detail in tact. Use a paint such as Rustoleum Painter's Touch gray primer. Spray paint with several light coats until you achieve a good even coverage. Once the primer has completely dried, paint using Rustoleum Painter's Touch spray paint in granite. For the best result, spray paint several light coats. Paint again, this time applying a metallic paint, with a specialty metallic paint roller. Using a regular brush can leave brush marks; giving a scratchy, less than even result. Try a regular roller with your paint first, but if you're not happy, use a metallic paint roller. Roller several coats of the paint. Apply several light coats of metallic spray paint, like Rustoleum "Silver Metallic". Cover your piece with a glaze, such as Valspar's Antiquing glaze. Make sure you apply it to corners and carved areas. Using a dry paper towel rub the glaze into the paint, until dry. Apply several protective clear coats for either a gloss for a shiny finish, or brush on Minwax water based Polycrylic in semi- gloss, in either spray or by hand. Sand with very fine sand paper if you have bumps or brush marks. Spray paint your hardware with very light coats of paint to match your piece. 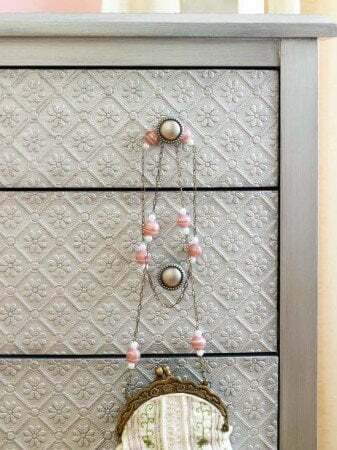 This technique from Petticoat Junction has less steps; fewer layers of paint for a less aged look in much less time. Apply 2 coats of Zinsser Primer in gray. Allow to dry. Apply 1 coat of Martha Stewart Precious Metals in Mirror. Allow to dry. Brush the piece with Caromal Colours Toner wipe off with a dry rag in random spots. Find the full tutorial here. Another beautiful piece from Petticoat Junction is this trolley. The toner ages your furniture and cuts the shiny silver look without hiding it. For a shiny look, don't use any toner. 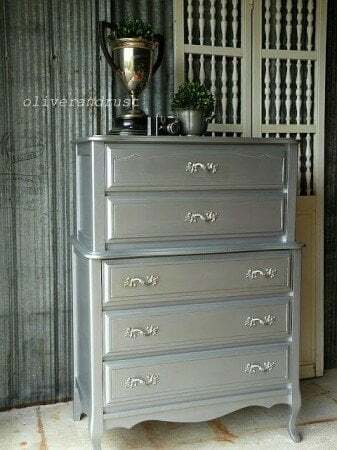 How to Create a Faux Silver Painted Furniture? There are always shortcuts to get a look. This look from BHG adds paintable wallpaper to the front of this chest to add texture and interest. The wallpaper selected looks like pressed or tooled metal. Remove the drawers and hardware. If you stack the drawers, you can easily align the wallpaper pattern for a seamless look. Cut the wallpaper to size. Glue the wallpaper to the front of the drawer using decoupage medium on the drawer front and the back of the paper. Allow to dry according to instructions. Paint over the paper with a base coat of silver paint. Allow to dry then glaze with a pewter glaze to give an aged or antique. Seal the surface with a coat of decoupage medium. Cheap Silver Paint or Expensive Metallic Silver Paint? 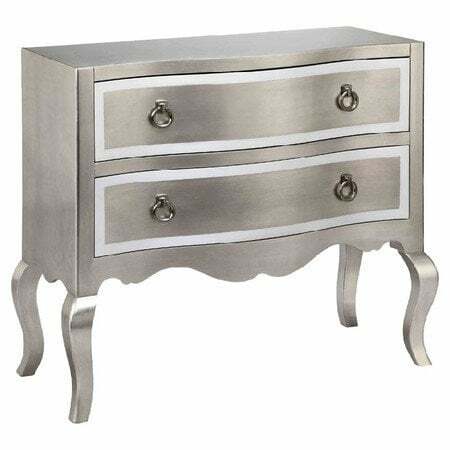 Depending on the quality of the silver spray paint or silver furniture paint you choose, your furniture could look incredibly expensive and glamorous or like plastic silver covered furniture. Cheap silver spray paint may look attractive but it may not give you the result you want. You might cover your cheap look with a glaze or clear wax, but it pays to investigate and know the look you are going to get from the start. Get samples if possible and look at dried samples before you decide or buy. Try this look on lamps, ottoman trays or bedroom nightstands. I love the aged looks. The shiny looks don't really fit with my other decor. I'm not sure where I can get that toner. I'm in Canada. I only half painted a piece I love but now I prefer this look. Can I paint this over Milk Paint? yes of course... milk paint could look great. You may need to sand it a little first. Do you want the chippy look? If so, this will work well. If not, you will need to add a bonding agent so the milk paint won't come off. I was wondering if you can help me. I am looking to good paint for my desk. I want to give it a shining silver look. I bought some spray paint at Canadian Tire, Rona, Home depot etc. It doesn't work. The look is not the silver shining and it came out when I touch it. Could you help me? Thank you so much! try “Super Silver” by Design Master. Michaels supplied it. Not sure if they still have it but its one of the best finishes for a silver leafing look. Hello. I wanted to let you know that I have a huge mirror that has brown borders. It's really dark and doesn't go with my 'metallic look'. I watched the video up above and the girl mentions using an electric sander and grit paper 60 and grit paper 120. I noticed on your instructions that you don't say anything about using any kind of sander or any kind of grit paper. Do I need to sand the mirror borders at all? I want to paint the borders of the mirror metallic silver. This is my first time and I am totally not a DIYer NEVER EVER. So I'm really nervous because I don't want to ruin the mirror. Can you please help me with all of the steps and if I need to get a sander. I'd rather not use a sander if I don't need to, but if for some reason I need to then I will, but only if I have to! Is it better to use a sander and grit paper vs not using a sander and grit paper? Thank you. Sorry this is so long. Remember write as if I'm a Dummie because I am! Thank you so much! thanks for the email. This will really depend on the condition of your mirror borders. Are they rough to touch or smooth. A sander is not necessary but its always good to run some paper over it by hand if its not completely smooth to the touch. This can make a difference to the end result. It also depends on the type of paint you use. Investigate the types of metallic paints you are likely to use and look at their instructions. If they suggest sanding, then take their lead. Hope this helps a little. I recently found a bed at an amazing deal, but it's painted a metallic gold and doesn't fit my style at all. It called the Hayworth canopy bed (gold), but I have no ideas on how to tone it down. Any tips? this was done using Martha Stewart’s Silver Leaf Silver Leaf, if you can't get that then try Quayside – This paint is mixed up at the hardware store priced at $22 a can. There are no sample sizes. Another silver color that works well, this time in a can is Rustoleum Hammered Silver or aluminum color also by Rustoleum. It’s available in a spray can and in a quart can. Hope this helps! What kind of top coat would you use over metallic paint? I read that most top coats will dull the metallic look. I used Krylon's shimmer metallic spray paint in candy razz on a table, and they don't make a top coat suitable for it. It's a modified alkyd, and trying to find a top coat that's compatible, durable, and not dull. Here's a link to a youtube video to see the look. https://www.youtube.com/watch?v=zAWhesLFpSo - you can see how it picks up the metallic paint. If you would prefer a flat finish, then go for their Dead Flat range. I'm looking for metallic silver but that it looks shinny, classy style, what should I use. It would be to paint a tall dresser and two night stands (wood). Great idea! They will look brilliant! There are so many and the best are expensive. Both Martha Stewart, Modern Masters and Rustoleum have good ranges. Martha's ranges change from time to time but Rustoleum have a solid range. I would stick with those brands. Here are links to a couple of the metallic paints - one is cooler the other is warmer but both silver. They have two that could suit - the warm silver and platinum look great. Hope this helps you! When you finish these pieces will look fantastic!